With its almost-all-female Twelfth Night, CalShakes has set a very high bar in what is emerging as “the summer of the woman” among Bay Area Shakespeare Festivals. Concerned with the lack of opportunity traditionally cast productions offer women, both the San Francisco Shakespeare Festival and Santa Cruz Shakespeare have announced they will perform with casts that have gender parity. Sacramento Shakespeare is performing an all-female As You Like It (along with an all-male Romeo and Juliet), and even companies with more traditional approaches seem to be producing an unusual number of plays with featured female protagonists this summer. 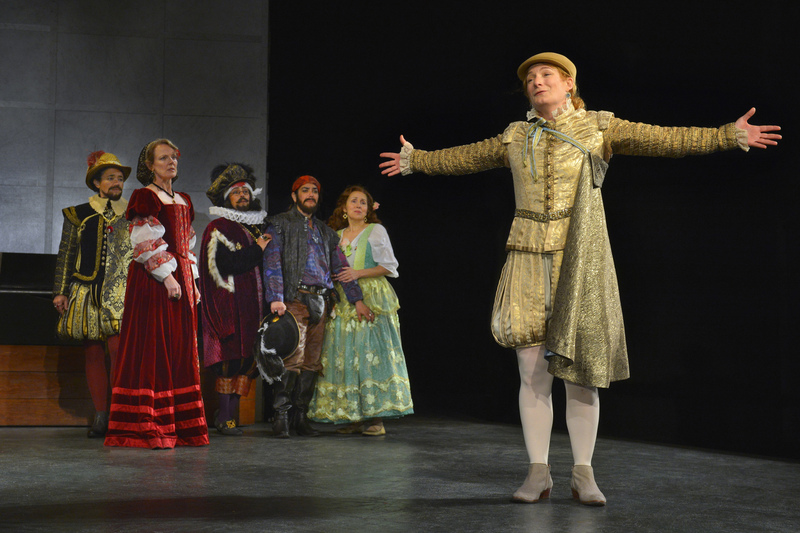 Lisa Anne Porter as Viola and the cast of California Shakespeare Theater’s production of TWELFTH NIGHT, directed by Christopher Liam Moore; photo by Kevin Berne. Achieving more opportunities for women is not as simple as it sounds, however. Shakespeare’s plays (written originally for an all-male troupe) have a limited number of female roles – four or fewer per play – in comparison to the dozen and up male parts. That number might be improved slightly because occasionally there are parts that do not really have a gender, like the narrator, Chorus, from Henry V, that can be easily cast with women. And there are numerous small roles that can be re-gendered safely, but how great a break-through is it to be allowed to play “2nd servant” in a dress? Such condescension is often more objectionable than not being cast. Finally, of course, there is the possibility that some women can undetectably pass as males, but that is a very limited casting pool and is not the opportunity of which most actresses dream. There are, therefore, a very limited number of ways that one can produce the plays, at least in a traditional way, that does much to address the problem. The exercise only becomes interesting for both audiences and actors when women play “male” roles from their own viewpoint, bringing fresh and exciting perspectives to narratives about which we have grown complacent. Last fall, in her terrific solo show, Shakespeare and the Alchemy of Gender, the great Lisa Wolpe demonstrated a knack for imitating the physicality and vocalization of men – especially tragic heroes – but became revelatory when she assumed (and simultaneously “commented” upon) the attitudes of male privilege. What makes her so exciting as our reigning “Shakespearean drag king,” is that we never lose sight that she is a woman who sees how “maleness” is constructed and rewarded, and not that she does some kind of perfect impersonation. 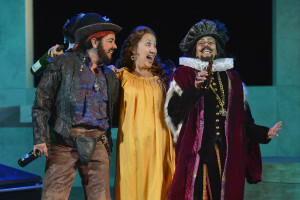 (L to R) Catherine Castellanos as Sir Toby Belch, Domenique Lozano as Maria, and Margo Hall as Andrew Aguecheek. photo by Kevin Berne. Outstanding as he is, however, it is the women who rock the night. Catherine Castellanos, whose Toby Belch is all codpiece, gives an incisive portrait of a particular kind of male cloddishness. The falseness of her false beard is quite pointed – her aim is not sincere imitation, but satire. Her partner in crime is the brilliant Margo Hall, whose Sir Andrew Aguecheek is so effeminate that we cannot help but see how artificial our gender constructions can be. Hall is hilarious, precisely because of the incompletely digested gender codes her character displays. Remi Margron completes the trio of false-facial haired characters with a love-sick Orsino whose emotional range was far greater, and more convincing, than any that I can ever recall seeing. Perhaps the most interesting creation of the night was Stacy Ross in the role of Malvolio. Unlike the bearded bunch, she was costumed and made-up in a way that scarcely bothered to nod toward maleness. Hers is not a particularly masculine face, and no attempt was made to alter it or her figure. If anything, in fact, her cassock looked (as they inevitably do) rather like a dress. The character was intensely interesting because the focus on her puritanical nature had almost nothing to do with gender at all. Later, having fallen prey to the deceitful trick that made her believe her mistress was infatuated with her, it was her shocking lack of a male conception of masculine display that provided the humor (and, of course, the larger commentary) as she writhed around in her yellow garters and a strategically placed giant yellow bow. Stacy Ross as Malvolio and Julie Eccles as Olivia. Photo by Kevin Berne. The cast also featured women in the traditionally female roles, particularly Julia Eccles as Olivia, and Domenique Lozano as Maria, and the contrast was exquisite. For once, one sympathized with Olivia’s impatience with Orsino’s relentless onslaught. In contrast to him, her maturity and composure were striking. All the more powerful, then, was the effect of her coming unglued at the sight of Cesario, who is actually the disguised Viola. One also understood that Maria was saving Toby, not simply failing to see through him. The evening turned on the performance of Lisa Anne Porter as both the twins Viola and Sebastian. Except for their attitudes toward fighting, almost nothing distinguished them, which turned out to be the best decision of the night. Viola is already “playing a man” in her disguise as Cesario, which we often feel in performance she is not doing very well because a very distinctly male person is being directly compared to her every time Sebastian comes onstage. In this case, however, the twins were truly identical – and the artificiality of gender constructions was highlighted in a way I have not previously experienced. The reality of what Viola was giving up by trying to live by men’s rules was heartbreaking, and the ease with which her brother was granted everything he wanted without so much as asking for it was shocking. The manner in which the play resolves, in a scene with both twins onstage, was well-handled directorially and perfectly appropriate for the play, but was less surprising than it might have been to anyone who saw the company’s production of Comedy of Errors last season, which used the same convention and virtually the same staging for its final moment. It would be a mistake to suggest that the performance was didactic about its non-traditional casting. Far from it; it was subtly employed in a marvelously entertaining evening. Nonetheless, successful cross-gender casting is challenging. What was so smart about this particular production is that almost as many approaches as cross-gendered parts were employed. It was the variety that most amazed, and in the end, spoke most eloquently for the practice. Nina Ball’s beautiful set, a sleek family crypt with an ever-present coffin to remind us that the play is essentially a memento mori, was stark and efficient. It featured a large central opening that allowed us to see Burke Brown’s beautiful lighting of the natural landscape in the distance as well as his subtle and effective illumination of the action. 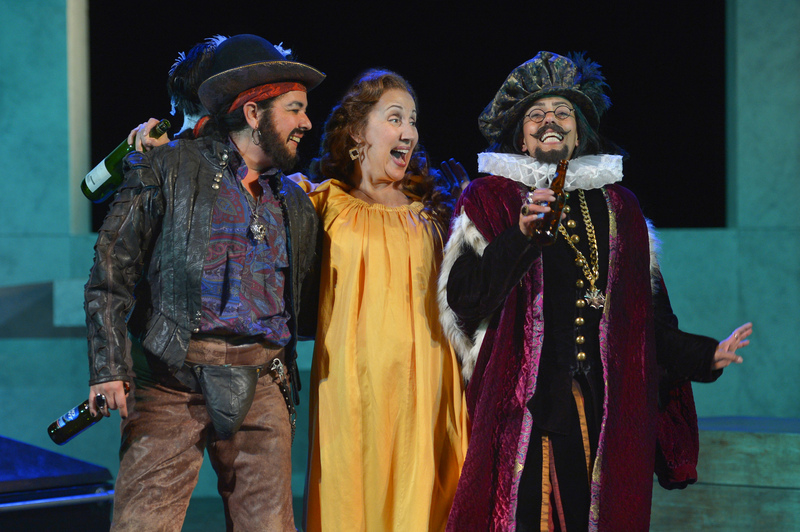 Along with Meg Neville’s delightfully detailed period costumes, the visual element helped explain – along with the adventurous non-traditional approaches it has repeatedly employed – why CalShakes has emerged as the premiere classical company in the Bay Area. Performances continue through June 21 – plenty of time to see this highly recommended production. 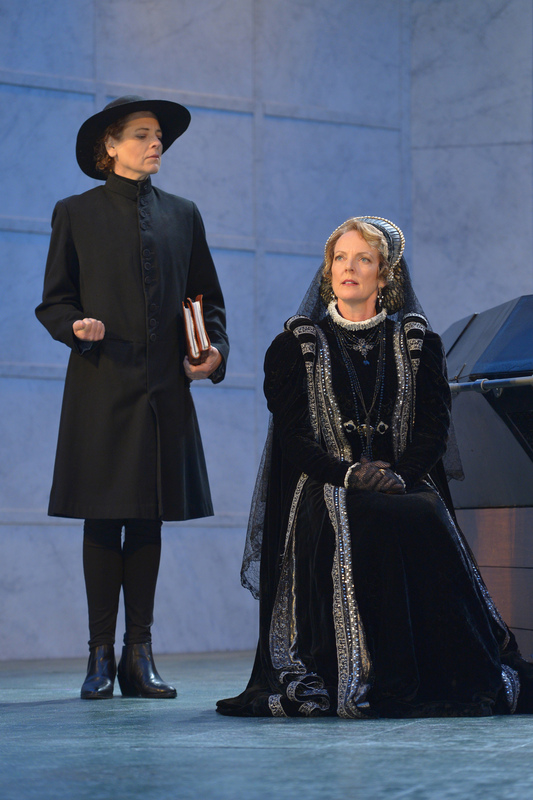 You are currently reading Top Girls: A Review of TWELFTH NIGHT at CalShakes at Shakespeare's Tribe.